I respect those who constantly try to improve their karting game and bring it to the next level. As long as you remain passionate, relentless and deeply committed to your goals, you will push way beyond your limits. If your aim is to gradually see the seconds melt off your course time, then you’re not a recreational kart racer, you’re an athlete. Because you’re an ambitious driver, you’re willing to do what it takes to become a winner. On your road to victory, you may realize you need a mentor, especially if you want your name considered among other renowned kart racers. Don’t let pride stop your progress, get all the help you need until your expertise is undeniable. The following tips consist of advice from the experts. They will help you improve as you search for the right mentor. Don’t ever lose sight of your goals. Your ability to visualize yourself crossing the finish line, is a unique gift. It is actually a sign of a great racer because you should always be able to see what you need to do before time. The more developed your visualization skills become, the more you’re able to perceive oncoming situations. As for the opposite, setting your sights on something that isn’t your goal will result in a backfire. In motor-sports this is termed “target fixation”. Just continue to focus your thoughts on your desired destination and your physical movements will follow. The ” master line technique ” is when you know how accurate you need to be when estimating the driving lines through corners. You will encounter several kinds of corners as you race:,,,Increasing radius ,90-degree bend, Decreasing radius, Constant radius, and Chicans aka “S Turns”. Each type of corner requires a different approach. Understanding the right line to pass through each corner will improve your performance, minimizing the time it takes you to complete a lap. This may be a difficult concept for some to grasp, but you can increase your speed by using your brakes more. The secret to winning races by using your brakes more frequently is timing. Most amateurs create more difficulty for themselves by using excessive acceleration. You’ll only end up driving recklessly into corners this way, also it will take you much longer to exit corners efficiently enough to reenter the straightaway. By being able to brake more quickly, you ‘ll regain throttle easier and exit corners at your highest speed potential. 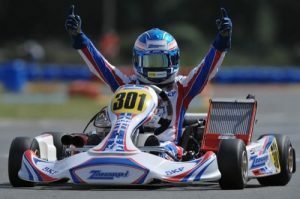 Always consider the basis for this technique, “The slower you are able to go into corners, the more quickly you can get out of them.” It is a proven fact that has saved hundreds of kart racers precious time on the track. You will dramatically improve your performance by a wide margin if you follow all of these tips, a few of which are not extracurricular but essential to becoming effective on the track. You’ll learn that constantly pressing the pedal to the metal only makes you believe you ‘re going the fastest you can, but lap times will indicate the opposite. As you gain experience for yourself, you’ll come to the realization that Karting is not all speed. It is a variety of taking calculative measures to maintain your performance over the course of every lap. Only master this skill if you want to race like a true champion.